Last.fm Trends takes a look at perhaps the highest profile award of all – the award for Entertainer of the Year. A star-studded list makes up the nominees but who will be victorious on the night? Read on to find out. Going for Entertainer of the Year is Jason Aldean, Kenny Chesney, Brad Paisley, Blake Shelton and the sole remale representative in the category - Taylor Swift. Only one of these acts had a new studio album out in 2011 – that being Brad Paisley’s This Is Country Music. Scrobbled 279,954 times since its release in May, it helps take his total scrobble count up to 7,124,039 and puts him in good stead for the upcoming awards. However with Taylor Swift involved it is always going to be an uphill battle for the other contestants. Her crossover appeal has led to worldwide recognition outside of country music and her listener counts compared to her rivals prove this. 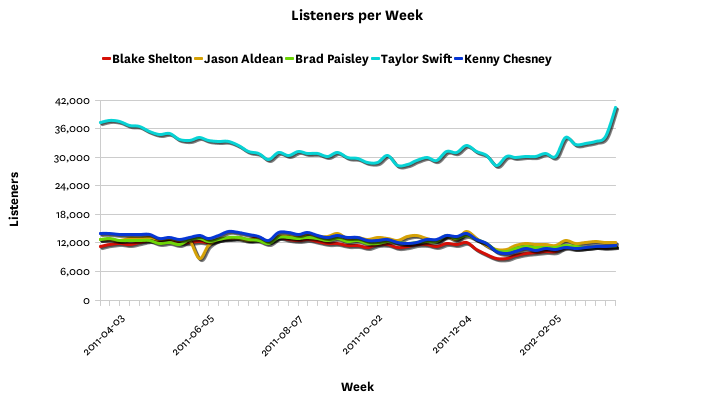 Despite not releasing an album since 2010’s Speak Now, her listener counts over the past twelve months recently peaked at nearly 42,000 listeners a week whereas all the other contestants have been loitering around the 12,000 mark. However with Taylor Swift winning the award last year, it may be time for someone else to take the limelight. Brad Paisley scooped the award for Top Male Vocalist last year and it may now be his turn to step up to the plate. Make sure to tune into the Academy of Country Music Awards this Sunday April 1st at 8pm ET/PT on CBS. This entry was posted in Music and tagged blake shelton, brad paisley, Jason Aldean, Kenny Chesney, Taylor Swift. Bookmark the permalink.